Leadership. Character. Commitment. Three simple words that Captain Adam Carlstrom professes over-and-over to describe what he does day-to-day, and that he deems are important for success in life. 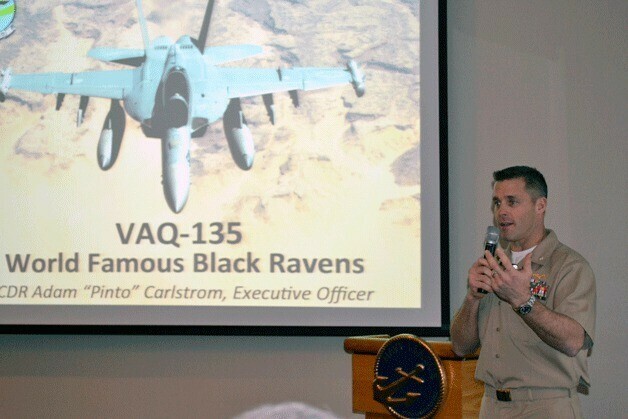 As Deputy Commander of Electronic Attack Wing, US Pacific Fleet for the US Navy, Carlstrom takes those words very seriously. His work purview includes 160 aircraft and close to 5,000 individuals. He also talks often about the goals of his unit: Man. Train. Equip. Getting the next person ready for their daily work. This motto could be on the door of every corporate human resources executive out there. Captain Carlstrom’s call sign is Pinto, he is part of a Miami merger and he was enjoyable to converse with.